When I was a kid in the late 1970s it was normal to carry a tiny Swiss Army knife in my pocket. I vividly remember sitting on the school playground, carving little sticks with my friends after school. Such deviant behavior would probably warrant a police investigation and a flurry of counseling sessions these days. Luckily, us 'big kids' still admire a well-made knife and haven't forgotten the fun we had. 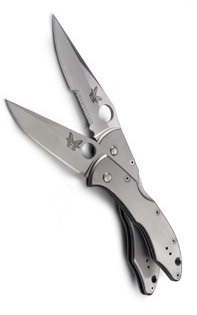 The Benchmade Knife Company was founded in California in 1988 and now occupies a 35,000 sq. ft. facility in Clackamas, Oregon. 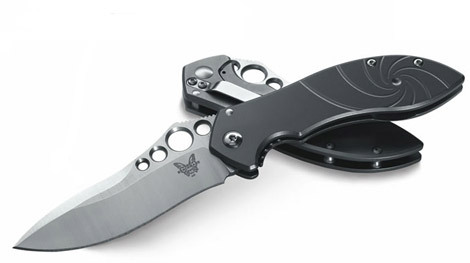 They've become known for innovative and attractive blades, including custom branded Harley-Davidson and HK Knives. The company stands apart, thanks to their state of the art manufacturing equipment and craftsmenship. They explain, "The Benchmade manufacturing arsenal contains ultra-modern laser cutters and machining centers dialed in for spot-on tolerances of 0.0005” on command. Our computerized machining centers offer the precision and control usually found only in the aerospace industry. Most of our products are hand assembled for a “go together” fit and finish typically seen only in a custom knife." It's been a long time. I wonder if I still remember how to carve wood?